The twelfth Nottingham Light Night will take place in the city next month, on Friday 8 February. Organised by Nottingham City Council in partnership with ‘It’s in Nottingham,’ the event welcomes Nottingham residents to take an orbital journey across the city from the canal side to the castle and beyond. 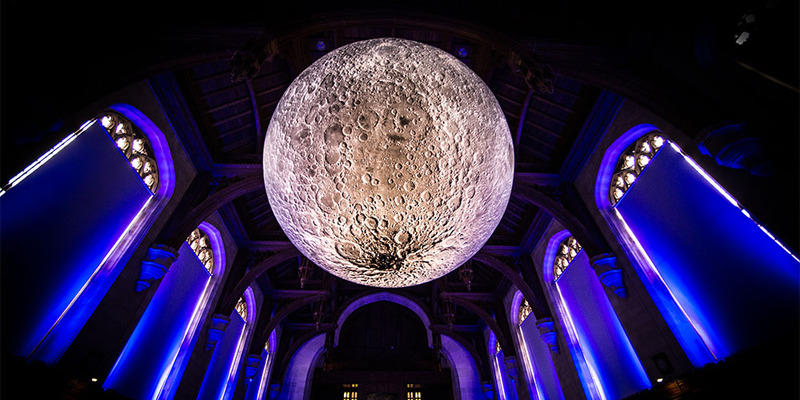 One of the highlights of the Light Night celebrations will be the Museum of the Moon, which will be landing on the Royal Concert Hall stage for the first time. Museum of the Moon is a touring artwork by UK artist Luke Jerram, who is known worldwide for his large-scale public artworks and sculptures. Measuring seven metres in diameter, the moon features detailed NASA imagery of the lunar surface. At an approximate scale of 1:500,000, each centimetre of the internally lit spherical sculpture represents 5km of the moon’s surface. This spectacular installation will be open to the public from 5pm-10pm on Friday 8 February, free admission, no ticket required . Not able to visit during the evening? There’ll be a second chance to see this unique sculpture in the majestic setting of the Royal Concert Hall auditorium on Saturday 9 February from 10am-4pm. Discover the magic of Light Night with exciting performances and enjoyable opportunities to take part in installations across the city at Old Market Square, Sneinton Market Avenues, Malt Cross and Nottingham Playhouse, all inspired by the 50th anniversary of Apollo and the first man on the moon.